Born July 28, 1935 in Fonda, IA and died October 28, 2017 in Waverly, IA. Roger Lee Heller joined the United States Air Force May 31, 1955 in Des Moines, IA, served during the Vietnam War era and reached the rank of Airman Second Class before being discharged May 30, 1959 in Lockbourne Air Force Base, OH. Roger Lee Heller served again in the United States Air Force and reached the rank of Staff Sergeant before being discharged August 20, 1965 in George Air Force Base, Victorville, CA. Release Date: October 28, 2080. Roger Lee Heller, 82, of Waverly Iowa passed away on Saturday night, October 28, 2017, at Bartels Lutheran Retirement Community in Waverly. Roger was born on July 28, 1935, in Fonda, Iowa, the son of Hulda Henrietta (Mack) and Cleo Donald Heller. He attended school in Fonda and at nine years of age, started working at the local meat packing plant after school. This was during WWII, and there was a shortage of laborers. He worked at the plant until he was sixteen. Roger graduated from Fonda High School in 1955. He served in the United States Army Reserve from 1954 until 1955, and then as a radar technician in the United States Air Force from 1955 until his honorable discharge in 1965. Roger worked for Collins Radio in Cedar Rapids as a computer technician. He retired at the age of 55. On June 12, 1967, Roger was united in marriage to Velda Cynthia Geuther at Ely, Iowa. The couple lived in Solon, Iowa, prior to moving to Waverly in the early 1990’s. Prior to Velda’s death on June 20, 2017, the couple celebrated their 50th wedding anniversary. Roger was a member of the Waverly American Legion Post #176. His favorite pastime was gambling, and Keno was his favorite game. Roger’s family was very important to him, and was very excited about the arrival of his great-granddaughter last September. He was a very loving husband, father, and grandfather. Roger is survived by his daughter Marigene (John) Barrett of Sarasota, Florida; two grandsons, Parker (Elena) Wojtanek of Bradenton, Florida, and Kevin Wojtanek of Boca Raton, Florinda; one great-granddaughter Nadia; one sister, Karole (Mike) Meese of Marion, Iowa; two brothers, Michael (Olga) Heller of Florida and Mervin Heller of Texas; and several nieces and nephews. He was preceded in death by Velda; his parents; and two brothers, Bill and Ronnie. Funeral services will be held at 10:00 a.m. on Wednesday, November 1, 2017, in the chapel at St. Paul’s Lutheran Church and School in Waverly, with Pastor Patricia Shaw officiating. Visitation will be from 5:00 pm to 7:00 pm at Kaiser-Corson Funeral Home in Waverly on Tuesday, October 31, 2017, and one hour prior to the service at the church on Wednesday. Burial will follow at Harlington Cemetery in Waverly, with military rites provided by the Waverly Area Veterans Group Honor Guard. Memorials may be directed to the homeless veteran’s house, with checks payable to LZ Phoenix, and submitted to Bremer County Veterans Affairs, 203 1st Ave NE, Waverly, IA 50677. Online condolences may be left at www.kaisercorson.com. Kaiser-Corson Funeral Home in Waverly is assisting the family. 319-352-1187. 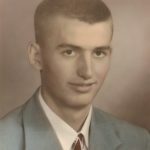 “Roger Heller Obituary,” Kaiser Corson Funeral Homes, Inc., accessed December 31, 2017. http://www.kaisercorson.com/obituary/Roger-Lee-Heller/Waverly-Iowa/1761069.